ISSA - The Greatest Story Never Told. Is the greatest story ever told . . . the complete story? Lois Drake masterfully weaves the threads of the "lost kingdom of the Kushans" and the "lost years of Jesus" into an inspired and authentic tapestry of adventure, intrigue and spirituality. Is the greatest story ever told . . . the complete story?? 2 B.C. Thousands of miles from Bethlehem, warfare rages between the Huns and the mysterious Kushan nomads, who would later establish a vast Asian empire�now lost to antiquity. Ancient Buddhist manuscripts tell of one St. Issa, whose life bears a striking resemblance to that of Jesus of Nazareth, and whose timeframe matches his "lost years." Lois Drake masterfully weaves the threads of the "lost kingdom of the Kushans" and the "lost years of Jesus" into an inspired and authentic tapestry of adventure, intrigue and spirituality. 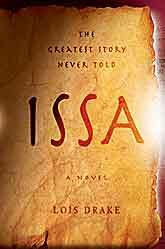 ISSA - The Greatest Story Never Told explores the life of young Jesus during his teens and twenties coming to terms with the meaning of life and the role he can choose to play. "JESUS STARTED FROM his sleep and sat up on his mat. He was bathed in sweat. The movement woke Joseph of Arimathea. "What is it? Another nightmare?" Copyright �2009 Summit Publications, Inc. All rights reserved.